Home » Uncategorized » The Millennials Are Coming! The Millennials Are Coming! Are You Ready? Being a native of New England, I couldn’t help using Paul Revere’s famous reference in calling attention to the major-workforce generational shift that is about to happen in America. Well, the Millennials are already here, though their presence will continue to grow as Boomers exit for retirement. If one takes a look at U.S. Bureau of Labor Statistics breakout of employees in 2013, it is shown that over one-half of employed persons are younger than 45, that includes Gen Xers, who, in 2014, are between the ages of 33 and 49, and Gen Y, or Millennials, who are now 32 and younger. So the generational shift is already in play. 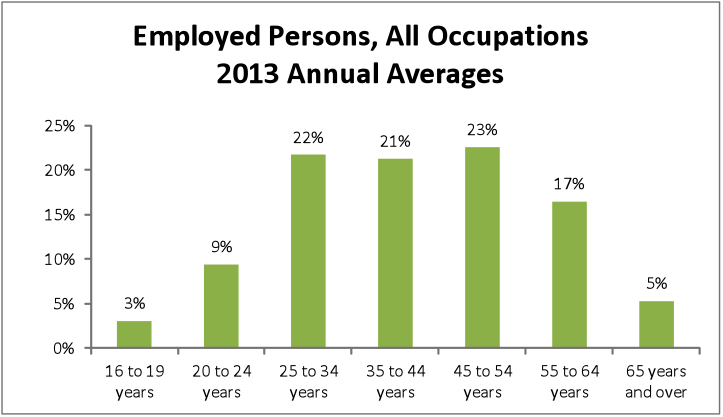 Source: U.S. Bureau of Labor Statistics, Current Population Survey (CPS). If you’re an organizer or an exhibitor, are you taking action to assure that your event or exhibit approach is in line with the needs and preferences of these young professionals? The time to take action is now! CEIR has resources to help you. Since 2009, CEIR has conducted generational research. Young professional attendee attitudes and preferences relating to business-to-business exhibitions are profiled in the report, Power of Exhibitions in the 21st Century. A follow-up report published in 2010 provides insights and advice on how to effectively market to young professionals: Power of Exhibitions in the 21st Century Phase II. Another report evaluates Generational Differences in Face-to-Face Interaction Preferences and Activities. To keep a pulse on what organizers are doing today to align their event content and marketing practices with young professional attendees wants and preferences, in late 2013 CEIR completed a study with organizers. Keep a watch for the release of Best Practices by Exhibition Organizers to Attract and Retain Young Professional Attendees in the coming month. Though the earlier research in 2009 and 2010 holds true today, as young professionals age and move forward in life stages, do their needs and preferences relating to business-to-business exhibitions evolve? And with the ever-transforming digital medium, do these changes have any impact on young professionals’ media habit preferences? How do they impact media preferences to learn about business-to-business exhibitions? And how they want to experience and consume a show? With funding from the Society of Independent Show Organizers (SISO), a new survey with young professionals was fielded and completed in the past month. A sneak peak of study results will be shared with attendees at SISO’s Executive Conference in Atlantic City next month, and the full report will be made available soon thereafter. Though if you want to be the first to know….. join me at this event!